I myself will be making this project many times as Christmas gifts for next year. Yes, it may be January but I am already thinking of next year. When I find great projects I can do cheaply…. I make 10 of them then put them in a huge box in my craft room. I will do the same thing for each project I find throughout the year then by November I create gift baskets for each loved ones aka friends and family. Take a hammer and slightly flatten one side then place it inside the can with the cut pattern. 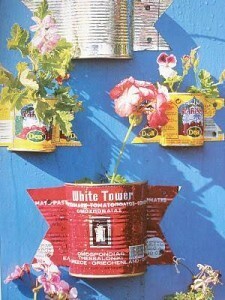 Fill with dirt, seeds or a live plant and nail to the wall but loose enough to be able to remove the inner can. You may want to hammer a few holes in the base of the can so water can drain out.